John Harrity shared a link. just got a full time job working at the new CT Science Center this summer. This has been a novel about some people who were punished entirely too much for what they did. They wanted to have a good time, but they were like children playing in the street; they could see one after another of them being killed — run over, maimed, destroyed — but they continued to play anyhow. We really all were very happy for a while, sitting around not toiling but just bullshitting and playing, but it was for such a terrible brief time, and then the punishment was beyond belief: even when we could see it, we could not believe it. For example, while I was writing this I learned that the person on whom the character Jerry Fabin is based killed himself. My friend on whom I based the character Ernie Luckman died before I began the novel. For a while I myself was one of these children playing in the street; I was, like the rest of them, trying to play instead of being grown up, and I was punished. I am on the list below, which is a list of those to whom this novel is dedicated, and what became of each. Drug misuse is not a disease, it is a decision, like the decision to step out in front of a moving car. You would call that not a disease but an error in judgment. When a bunch of people begin to do it, it is a social error, a life-style. In this particular life-style the motto is “Be happy now because tomorrow you are dying,” but the dying begins almost at once, and the happiness is a memory. It is, then, only a speeding up, an intensifying, of the ordinary human existence. It is not different from your life-style, it is only faster. It all takes place in days or weeks or months instead of years. “Take the cash and let the credit go,” as Villon said in 1460. But that is a mistake if the cash is a penny and the credit a whole lifetime. There is no moral in this novel; it is not bourgeois; it does not say they were wrong to play when they should have toiled; it just tells what the consequences were. In Greek drama they were beginning, as a society, to discover science, which means causal law. Here in this novel there is Nemesis: not fate, because anyone of us could have chosen to stop playing in the street, but, as I narrate from the deepest part of my life and heart, a dreadful Nemesis for those who kept on playing. I myself, I am not a character in this novel; I am the novel. So, though, was our entire nation at this time. This novel is about more people than I knew personally. Some we all read about in the newspapers. It was, this sitting around with our buddies and bullshitting while making tape recordings, the bad decision of the decade, the sixties, both in and out of the establishment. And nature cracked down on us. We were forced to stop by things dreadful. In Memoriam. These were comrades whom I had; there are no better. They remain in my mind, and the enemy will never be forgiven. The “enemy” was their mistake in playing. Let them all play again, in some other way, and let them be happy. I think I found a place to live!! All of us, who are worth anything, spend our manhood unlearning the follies of our youth. i know you’ll help us when you’re feeling better, and we realize that it might not be for a long, long time, but we’re willing to wait on you, we believe in everything that you can do! if you could only lay down your mind. Among lonely people there is not a single one who can be sure that in his suffering he might not yet console someone else and that the gestures of his most personal heplessness, like so many cues and signals, might not serve as signs guiding the way in the realm of the unfathomable.–rainer maria rilke. thanks cait. This is a great, short, Buddhist tale from Korea…if you don’t have the attention span/desire to read the whole thing, the end* is the part I like most. the final count down. wish me luck! 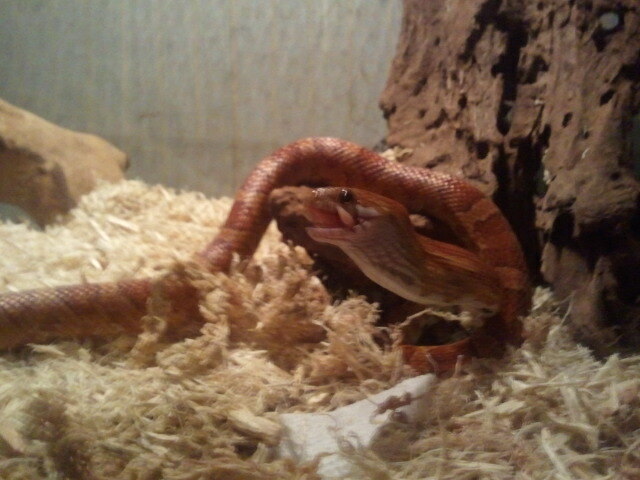 RIP Domingo, the best pet snake a guy could ask for. so it goes. sigh. feelin real low down…hungry, angry, lonely, tired and i just don’t know what to do anymore, no one to blame but myself. i should be graduating from college this year; instead i work a 17 year old’s job at a stop and shop and it’ll be 2014, 2+ more years of school before i have any kind of degree, and i have no idea what i want out of that time. i know i have much more than so many, but it doesn’t make that emptiness go away; i still feel like a waste of a person. i had so many gifts and opportunities at every turn in my life, and i took them all for granted, buried them under the debris of my youth thus far. i go back and search through my mind, the notes of my choices and where i went wrong…try to dig out and pull up old dreams, but the past just gets me caught up in myself, navel gazing, and i choke. i’m 21 and i feel like i haven’t changed much–at least not enough–since i got my high school diploma. i learned a lot about what not to do,what not to be, and now i’m just by my lonesome countin flowers on the wall most days, no one but the ceiling to talk honestly with. when i did meet new people, if things got too close i always shut it down. now i don’t even know how to start the damned thing. of course i have good folks in my life who i love, a few friends and my family, very close to me, but even with them i’m ashamed to say i have trouble being real, not just some put-on. fed up with myself. i have a mound of evidence that says i don’t or won’t use what i’ve learned from my personal disasters and successes to grow the hell up and do something with myself or whatever it is i need to move on from this stuckness. i dont feel like an adult, or like i’m even really becoming one, and watching my peers continue to do that, mature, hurts me deep in a selfish way. walls feel like they’re closing in…a year out of school, at home, and things seem more bleak than when i got here. the world seems like its running ahead away from me, faster and faster. meds, therapy, they’re great, i wish everyone had access to them, but for me, despite them, right now i still can’t seem to move up out of this stagnating place. and at the end of it all, this damn vast emptiness, and no one but me who put me here or who can get me out… so alienated i’m posting this dreck in public, in front of relatives, old elementary school friends, everybody. alright facebook, this is as real as i will ever get here. done whining for tonight, no more dramatics, although it seems like all i know how to do is moan and groan! but i’ll make it, most likely, same as any of us will. 10 bucks says i delete this when i wake up tomorrow. thank you so much to the people who commented and sent me messages this morning, it really meant something to me, to see how many people care about me even before 10 am. sorry i took the post down (i turned it into a note), i just don’t want people to think im more blue or downtrodden than i really am. i know i’ll get where i’m going whenever i get there, and hopefully it’ll be a good place, but sometimes the uncertainty and regret can get pretty frustrating. its pretty terrible to feel like you’re going nowhere fast, even if you know you aren’t, truth? thanks for caring for each other folks. listen! out of ideas. don’t know where to be. so it goes.